Although I demanded and got reasonable prices for most better items, the hardest items to part with were the ones that had nostalgic value. These included my 1963 Gibson LG-1 I got new when I was about 14 and a Stella (by Harmony) mandolin I bought new sometime around 1973. An Ami Spruce parlor guitar by Arts & Lutherie was also difficult so see go. It was the only guitar I ever received as a gift. After I’d been playing guitar for about two years my father realized I was sufficiently serious to get a better instrument than the plywood toy I had been using. He would match whatever money I could save to help me purchase a better guitar. This was the early 1960s and low priced, overseas manufactured guitars were rare. I could afford a used Gibson Melody Maker, Les Paul Junior or a new Danelectro if I wanted an electric guitar. I couldn’t afford an amp at the time, though a few years later I managed to buy a used Silvertone Twin 12, 40 watt amp. I ended up getting the Gibson LG-1 acoustic. 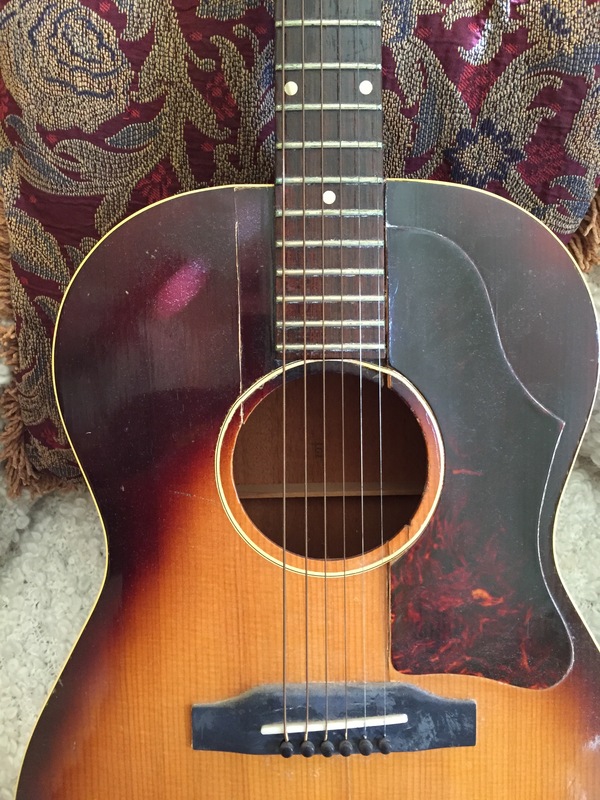 There was only one model of Gibson acoustic less expensive than the LG-1 at the time — the LG-0 all mahogany model. The action was always crap on the guitar. I don’t think the neck angle was properly set. Gibson saw these as student guitars and had poor quality control. It wasn’t just the neck angle they had problems with. Years later I was reading an article about vintage instruments and learned the bridges on the LG-1 were not staying glued in the years before my guitar was made. They devised a solution for this problem in 1963. They bolted the bridge to the body. I couldn’t believe it. There was no evidence from the top. 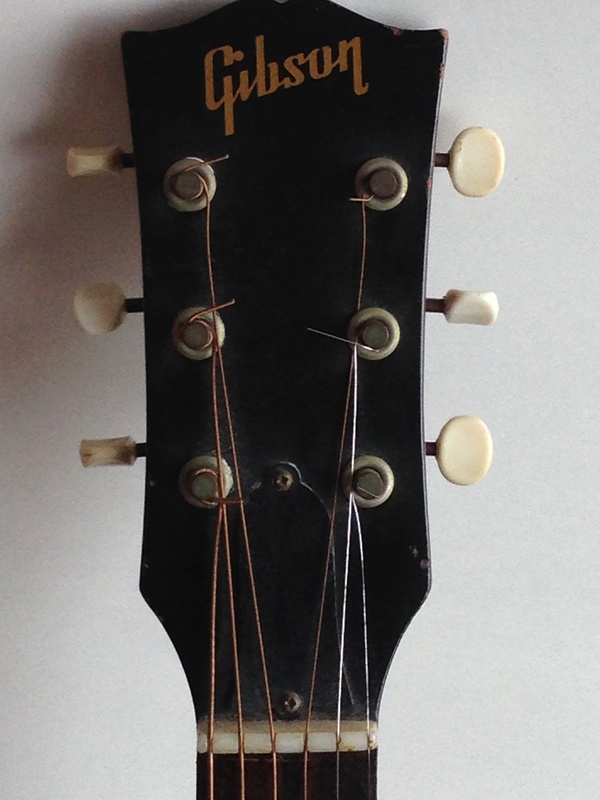 But I reached into the soundhole and sure enough, there were bolts protruding into the guitar holding on the bridge. My brother also got a LG-1 a few years after I got mine. They had abandoned the bolts by then but hadn’t solved the problem. His bridge lasted for years but eventually he had to have it re-glued when it started to separate from the body. The first image above shows the results of 52 years of neglect and abuse on my LG-1. There is a large crack in the body near the fingerboard. The action is unplayable. The cardboard chipboard case disintegrated years ago. The guitar had become a wall decoration. The image on the left shows the first injury the guitar received. I was still in high school and the guitar still felt new to me although it may have been a year or two old by the time of the incident. By the time of the “incident” I had bought the Silvertone amp I referred to above. Some of my guitar playing high school buddies and I were jamming in the basement of my home. My friends had “real” electric guitars. I had a Kent soundhole pickup in my LG-1. I also had a skinny leather guitar strap with a shoulder pad. I thought it was an Elvis-like look. I bent over and reached to adjust the settings on the Silvertone. The amp was the model with the separate head — pretty cool. And then it happened! My strap broke, my guitar dropped to the concrete floor and bounced on its edge. I was devastated. My new guitar broken. My dad would kill me if he found out (or so I thought — that’s how the teenage mind works). 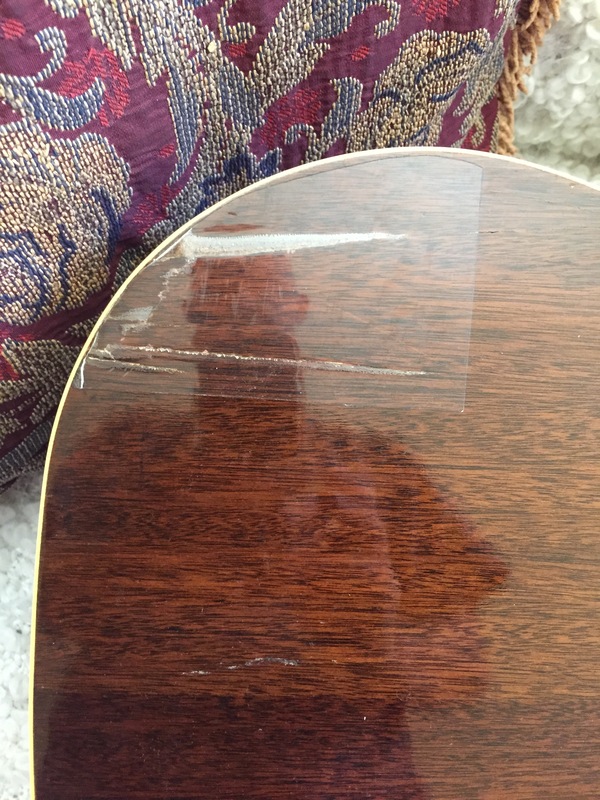 Even if he didn’t kill me, it was my first (allegedly) decent guitar — a Gibson — and now it was broken. As you can see from the pic, I kept the crack from spreading by covering it in the plastic people used to use to laminate driver’s licenses before licenses were made of plastic. The “fix” though a terrible idea, actually worked fairly well over the next 50 years. It was perhaps the least of the problems I had with the guitar. But it was the injury I felt worst about. I learned a few lessons from the broken strap. First, this was not a problem of the strap slipping off the strap button nor was the break at the strap button. The break was in middle of the strap and happened due to fatigue of the leather. The real problem was it was a cheap strap and not made of genuine solid leather but instead sort of leather bits glued to seem like solid leather (pressed leather). So, first lesson learned: always buy a quality strap for your guitar. The strap doesn’t have to be expensive. I’ve got Ernie Ball nylon straps that cost under $10 and are great. But the strap has to be well made. The second lesson I learned is to always make sure you are holding on to the guitar with at least one hand. I never let the guitar just hang by the strap anymore. Although the incident did not involve the attachment point of the strap to the strap button, this is a known weak link. I’ve put Schaller Strap-Lok buttons on all my electric guitars and the straps that go with them. That wasn’t the only indignity my LG-1 suffered. There was the time I thought having a fretboard like Rickenbacker electrics would be fun. I liked the Rick 360/12 and the fretboard seemed like glass. Actually it was like thick polyurethane or varnish. I thought I could do the same to the LG-1 fretboard. Even I soon came to realize this was a bad idea. Not soon enough. Unfortunately the recovery of my sanity and realization of what a bad idea it was to brush polyurethane on my fretboard did not occur until my paintbrush had nearly completed its first long stroke down the rosewood. I immediately tried to remove the polyurethane but I never got it all off. 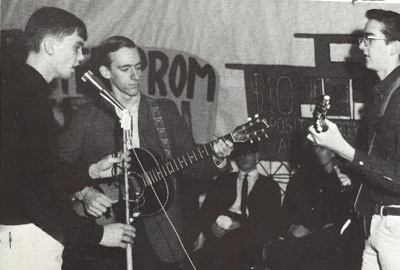 Dan (center) playing his LG-1 at high school about 1966. In spite of the bad things I remember, I will miss the guitar. I essentially learned to play on this guitar. My love of small body guitars is no doubt due to playing only a small body guitar for more than half the time I have played guitar. It was the major possession I had owned the longest, and now it is gone. They good news is the person I sold it to plans on restoring the guitar. LG-1s in excellent condition (not mine obviously) have sold in the past for about $1000. It is made from all solid wood — spruce top and mahogany body. It might take some work but it has the potential to be a really nice small guitar. Goodbye LG-1, I’ll miss you (even though it has been years since I played you). I still have my Martin OM-28 and nostalgia be damned, I love the OM-28 much more than I ever loved the Gibson. Sypathies dan – I’ve sold very few of my instruments and even now in my 60’s still hang onto 40+ of them – from Gibson down to Saehan (Best Chinese cheapo) love em all.